20 THE SHOP JANUARY 2019 GET OUT! 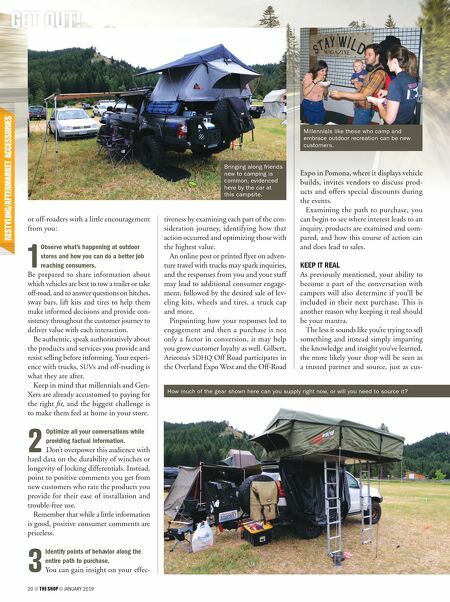 or off-roaders with a little encouragement from you: 1 Observe what's happening at outdoor stores and how you can do a better job reaching consumers. Be prepared to share information about which vehicles are best to tow a trailer or take off-road, and to answer questions on hitches, sway bars, lift kits and tires to help them make informed decisions and provide con- sistency throughout the customer journey to deliver value with each interaction. Be authentic, speak authoritatively about the products and services you provide and resist selling before informing. Your experi- ence with trucks, SUVs and off-roading is what they are after. Keep in mind that millennials and Gen- Xers are already accustomed to paying for the right fit, and the biggest challenge is to make them feel at home in your store. 2 Optimize all your conversations while providing factual information. Don't overpower this audience with hard data on the durability of winches or longevity of locking differentials. Instead, point to positive comments you get from new customers who rate the products you provide for their ease of installation and trouble-free use. Remember that while a little information is good, positive consumer comments are priceless. 3 Identify points of behavior along the entire path to purchase. You can gain insight on your effec- tiveness by examining each part of the con- sideration journey, identifying how that action occurred and optimizing those with the highest value. An online post or printed flyer on adven- ture travel with trucks may spark inquiries, and the responses from you and your staff may lead to additional consumer engage- ment, followed by the desired sale of lev- eling kits, wheels and tires, a truck cap and more. Pinpointing how your responses led to engagement and then a purchase is not only a factor in conversion, it may help you grow customer loyalty as well. 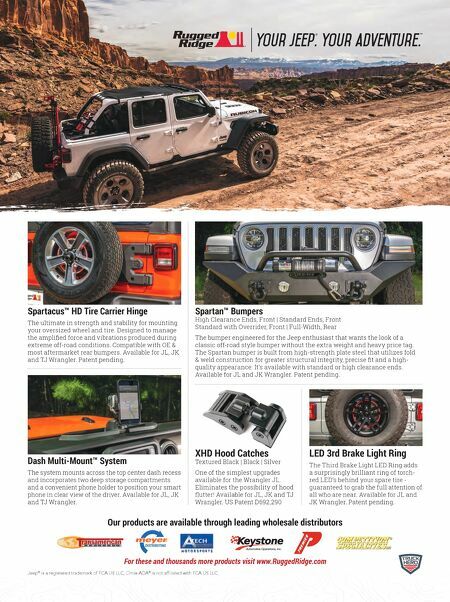 Gilbert, Arizona's SDHQ Off Road participates in the Overland Expo West and the Off-Road Expo in Pomona, where it displays vehicle builds, invites vendors to discuss prod- ucts and offers special discounts during the events. Examining the path to purchase, you can begin to see where interest leads to an inquiry, products are examined and com- pared, and how this course of action can and does lead to sales. KEEP IT REAL As previously mentioned, your ability to become a part of the conversation with campers will also determine if you'll be included in their next purchase. This is another reason why keeping it real should be your mantra. The less it sounds like you're trying to sell something and instead simply imparting the knowledge and insight you've learned, the more likely your shop will be seen as a trusted partner and source, just as cus- Millennials like these who camp and embrace outdoor recreation can be new customers. Bringing along friends new to camping is common, evidenced here by the car at this campsite. How much of the gear shown here can you supply right now, or will you need to source it?